SIX Easy Switch-Ups For Spring! Spring is by far my favorite time of year. I love all the colors, the fresh grass greens, pretty pink and yellow blooms, clear skies and white puffy clouds. When Spring is getting close I like to add some elements to my room that will make my room feel a bit more fresh and happy. We are not decorating a store so we need to keep a handle on just how much decorating we do so we don’t look like things just might have a price tag attached to our displays. Before we begin remove everything except the pieces that will always stay in your room, furniture pieces, wall décor and lighting. Next look at the colors in your room and think about the colors that you love that could be added to your room to freshen it up. Take a look at a color wheel if you need help in finding complimentary colors for your room. Find the main color in your room and go directly across to find it’s compliment. The group of colors directly across are the strongest compliments but you can choose color families from each side of the compliment color as well. Such as Blue’s compliment is orange, yellow-orange or red-orange. 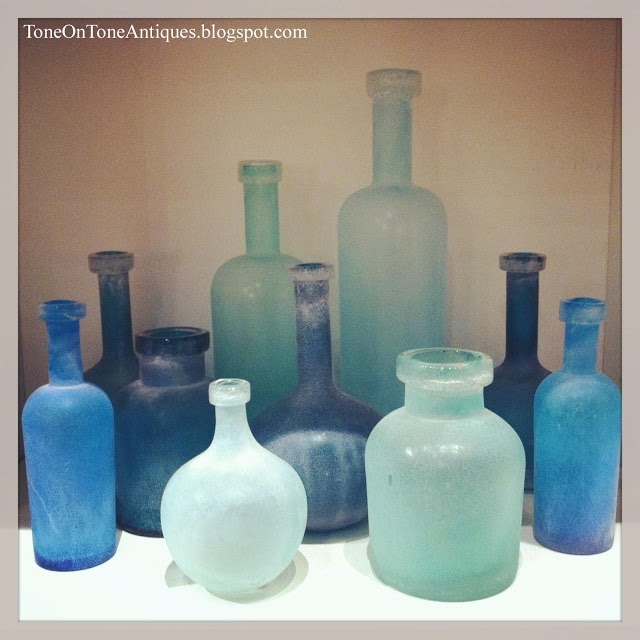 Using any of these color families will make the blue more vibrant in your room. If you want a softer compliment choose the color families on each side of blue, such as blue-green and blue-violet. Another way to pull colors out in your room is to look at any existing patterns in your room and pull the colors from there. These are just a couple of very basic guidelines. 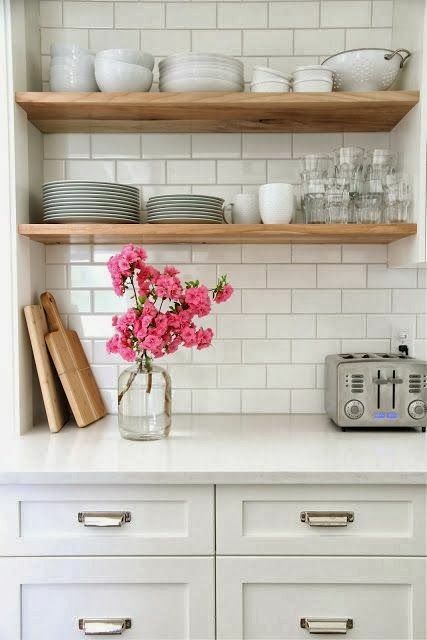 Next is time to make a list of Spring elements that are pleasing to you that you might want to add to your room. Keep in mind to not choose things that are overtly Spring that could make your room look like a store display, as I previously mentioned. Try to add elements with texture, color and life. 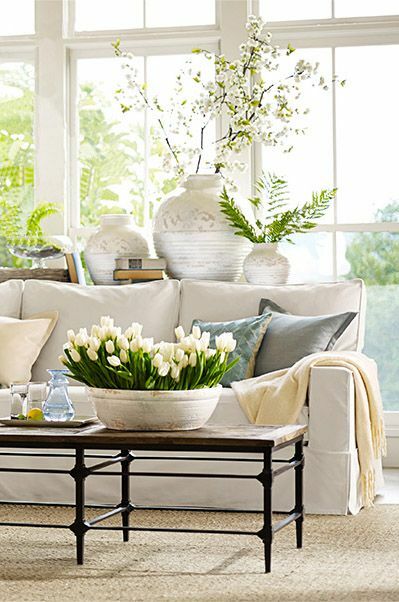 Flowers are a natural choice when it comes to Spring décor, but so are touches of natural greenery, or blooming twigs. I like to use flowers and greenery in my home all year long, but especially during the Spring months. This is the perfect time of year to display your favorite blooms. White tulips are a favorite of mine and using this rough hewn bowl full of tulips will make anyone get in the mood for Spring! 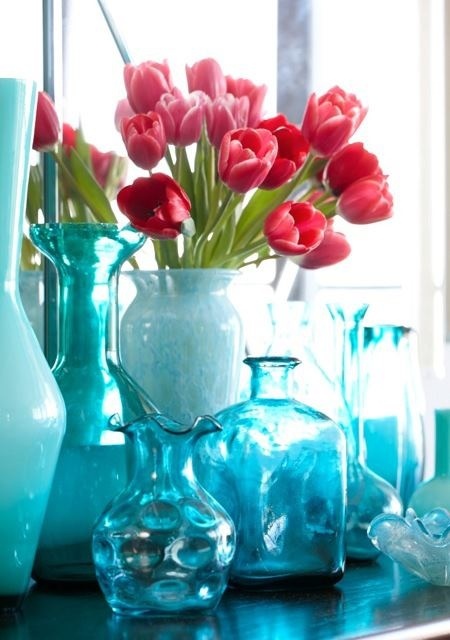 Using clear colorful glassware is a nice touch to add a bit of sparkle to a room. You can use a single piece or a group….. 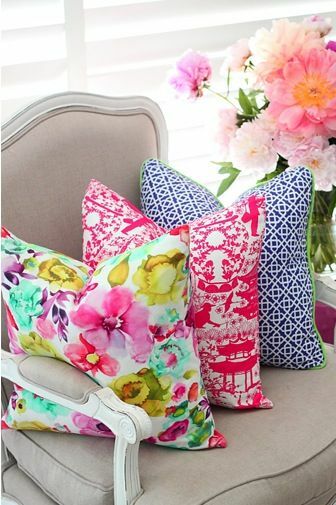 Adding some blooms to your composition looks very fresh and perfect for Spring….. Simple greenery from your yard is a favorite element I like to use in the Spring. 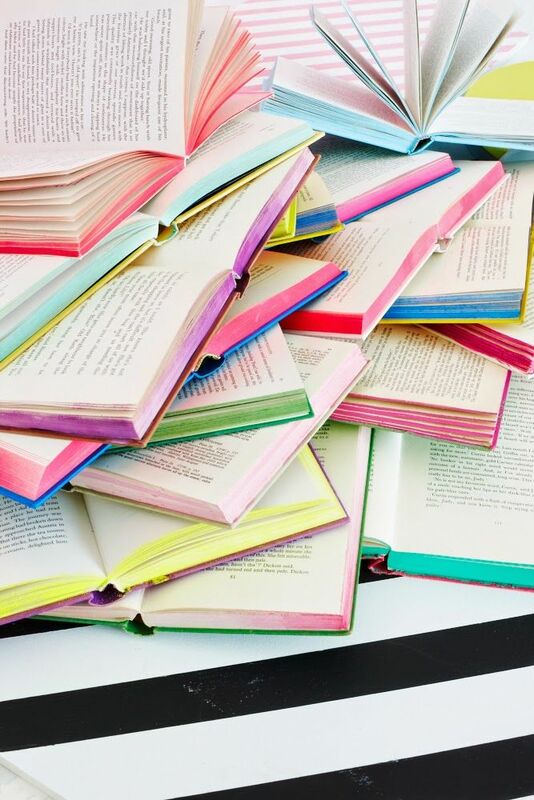 Brightly colored books used as lifts for a decorative item, or just stacked on a table can add a touch of Spring….. 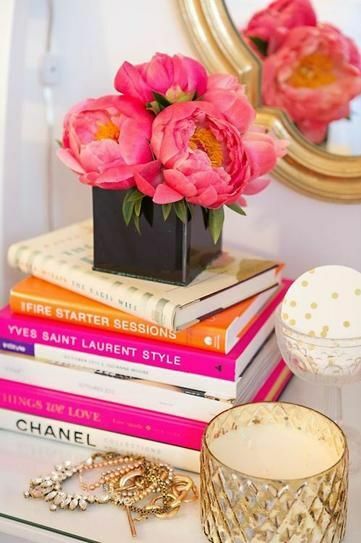 If you will notice the books colors are pulled together with the floral arrangements colors. The black of the vase is accentuated with the black and white spines of the books. Bright pink as in the flowers and even a pop of orange as in the center stamens of the flowers. Details, details! Another great example of how the flower and vase colors are pulled into the stack of books. If you don’t have just the right color of book spine, take a trip to the thrift store and purchase what you need for very little cost. 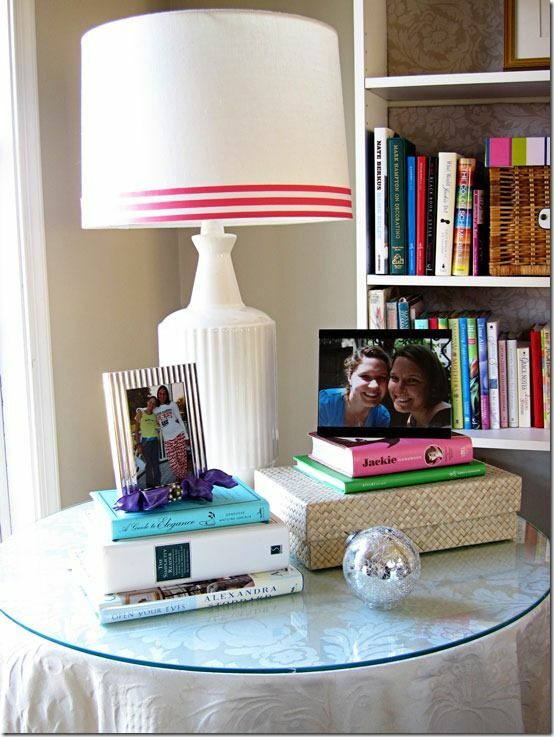 Another option is to cover your existing books with colorful papers or material. This is fun! Use brightly colored markers to color the ends of the pages! If your artwork is not expensive, and it can easily be replaced for a minimum cost, changing it out can totally change a room. I have found Etsy to be a great resource for some lovely prints that can be easily framed in standard size frames from hobby stores. Let me show you a few that have caught my eye……. This particular piece has all the elements I love in a room for my own home so naturally I gravitated towards this piece. 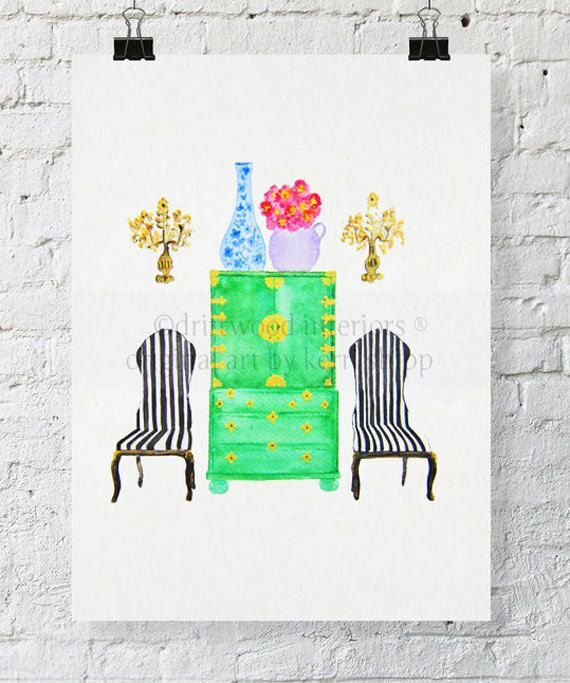 Kerri Ship has some brightly colored watercolors that will be sure to please your design aesthetics. You can find her work here. Colorful and affordable. Art.com has some very affordable options in all different styles of artwork. I chose this one from my artwork pinboard which has many pins of artwork that is appealing to me, personally. This particular piece is done by Lou Wall. There are many more colorful pieces on his page, HERE! Green is the color of Spring. Nothing prettier than the color of fresh, new grass. 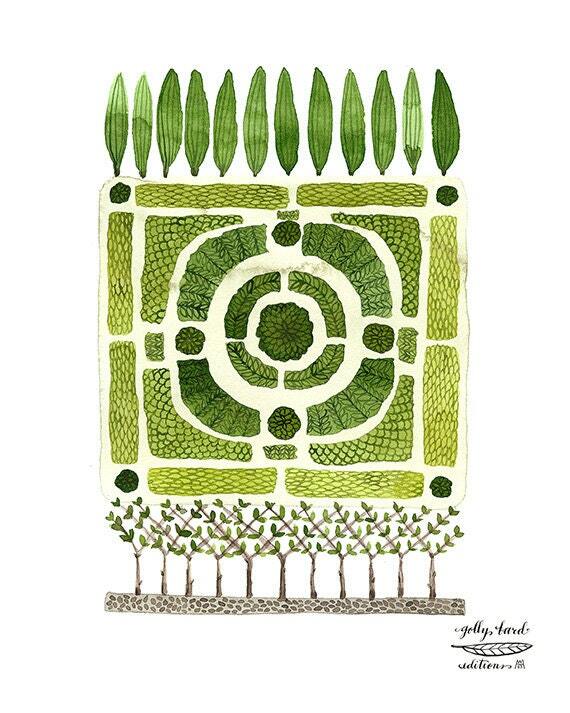 I love the depiction of this knot garden to add freshness and a touch of Spring to a room. This is neutral and could work in just about any setting. Found HERE! If you are like me, you like a throw to wrap up in even in the warmer months. When I quit for the day, and lay down on my couch to watch some mindless TV, I like an adult blankie/throw! This is where you can add pattern and/or color easily to your room. Your imagination is your only limitation when it comes to choosing. There are so many sources for both rugs and throws on the internet. Ikea and Target are probably the least expensive with some great variety to choose from when it comes to Home accessorizing. If you are looking for more of an investment piece then your options are pretty limitless. Just keep in mind your over all feel, color scheme, and patterns in the room. Keep patterns, and texture of the throw, light and airy for a Springtime feel. 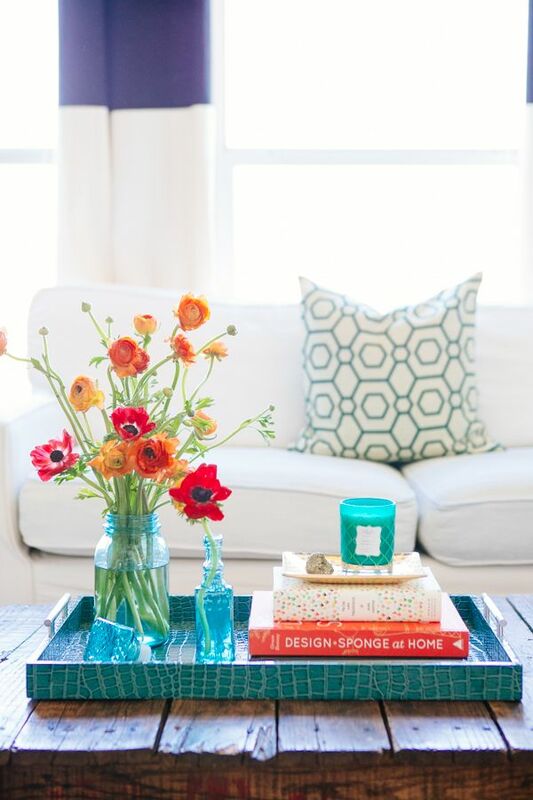 However sometimes a pop of a solid color throw is a great way to introduce interest, and maybe a new color in a room. If you room can accommodate some pattern and or color take a look at the options for lampshades. Target is a great source for affordable lampshades and they offer both color and patterns. 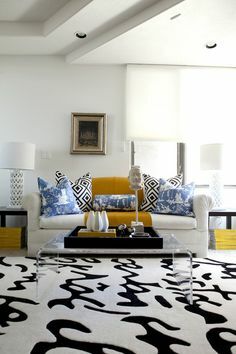 A happy yellow Ikat can mix well with many patterns. I like to switch out my darker lampshades with white shades for summer. You can add a little trim around the top, and bottom if you feel the need for a bit of embellishment, but keep it simple. Clear room of all accessories. Start with one main print or star, if you are choosing any patterns, then work off of that pattern for colors and other prints that will coordinate. Add Spring colors to your room by using lighter and brighter values of complimentary colors in your room. Add texture with spring time branches in bloom. 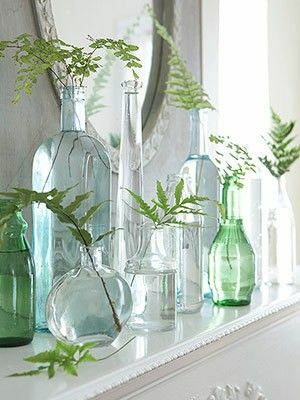 Add life to your room with fresh blooms or simple greenery in vases. 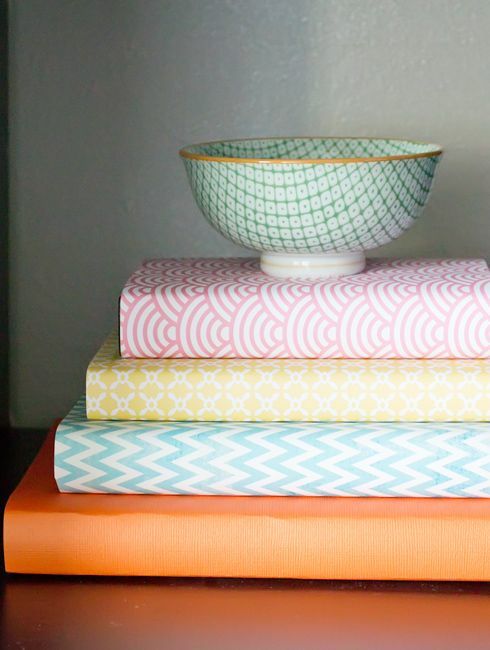 Use everyday colorful book spines to use as lifts on tables, mantels etc. Purchase some fresh, colorful artwork and frame in simple black or white frames purchased from the Hobby store. 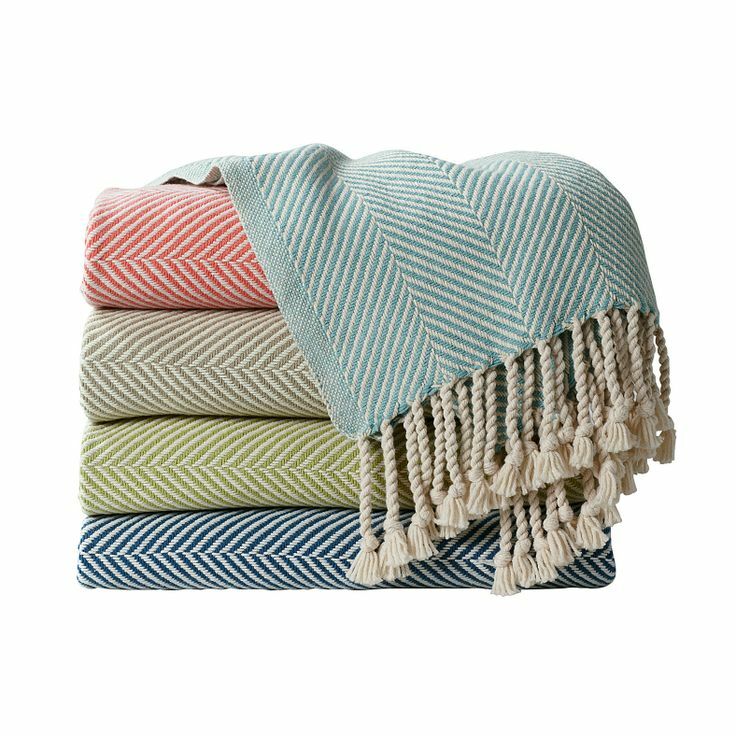 A new fresh, cheerful color/patterned throw is comforting and will add a touch of Spring easily to your room. Area rugs are easy to change up. Use one for Fall/Winter months and one for your Spring/Summer months. Remember, none of the above have to be costly, just well chosen. Make your plan of attack before making any purchases so you know it will all work well together. Once your plan is made then the fun can begin. It takes time and patience, but in the end you will be so happy with your end results. Switching it up for Spring!